Flags along the Ave.Despite allegations to the contrary made on a local blog, last weekâ€™s display of some 400 Vietnamese and American flags which sprouted on scores of Vietnamese-owned businesses across the neighborhood was the work of a volunteer committee working to mark the anniversary of South Vietnamâ€™s collapse in 1975. Tam Nguyen, a merchant from East Boston who helped to organize the effort, told the Reporter that the push to mount the flags was deliberately timed to mark the 34th anniversary of the fall of Saigon. Called the â€œfreedom flagâ€ by many Vietnamese-American emigrants, the flag with a yellow field and three red stripes has been displaced as the official flag of Vietnam. However, it is prominently displayed by Dorchesterâ€™s large Vietnamese-American population, many of whom fought against the Communist regime there. Diane Huynh, Meninoâ€™s longtime liaison to the Vietnamese community, said she was aware of the flag effort â€” and connected organizers to the cityâ€™s Inspectional Services Department to get permission to display the flags temporarily. However, she and Nguyen both denied that the mayorâ€™s office conceived of the idea or paid for it in any way. The Reporter, however, observed that â€” in factâ€” many of the storefronts flying the new flags also sported campaign signs for one of Meninoâ€™s rivals, Sam Yoon. Campaign placards for both men sprouted up in scores of stores along Dorchester Avenue in recent weeks. 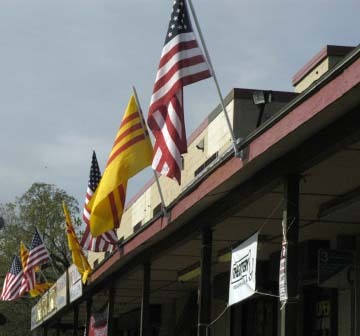 Support for the display of dual patriotism was overwhelming from the merchants in the area, Nguyen said. Nguyen told the Reporter that the display of Vietnamese-American pride will return in time for the annual celebration of neighborhood pride: the Dorchester Day Parade.